It wasn’t the first time I’d made macarons, but I’m not particularly practised at them and they did not turn out perfectly well. 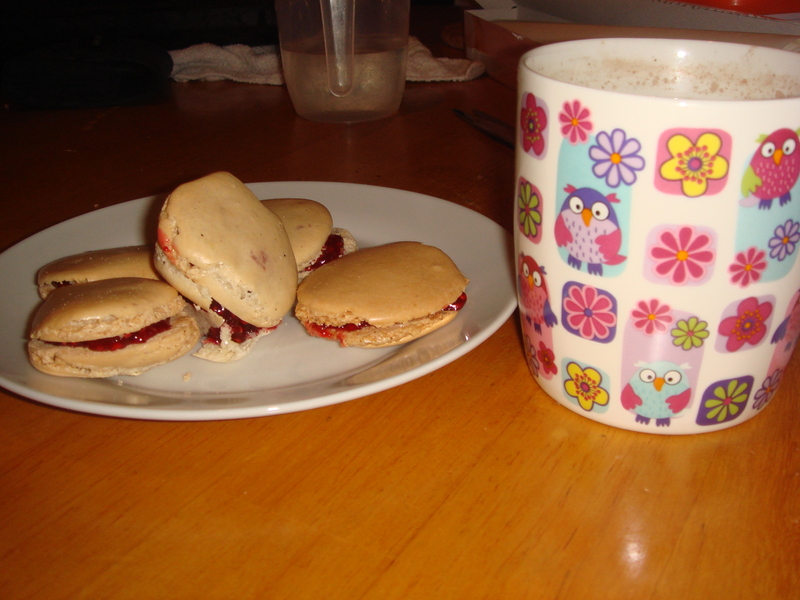 I used the recipe from Ottolenghi and made lime-vanilla macaron ‘shells’, sandwiched with raspberry jam. They were tasty but although the macarons had a perfectly smooth outer shell, they were hollow and stickily raw inside. Because of this I’m going to omit the recipe for macarons: I think it was my inexperience which led to the recipe not working properly, but I can’t guarantee it. Nonetheless, the flavour combination is much recommended – if you have a macaron recipe that’s tried and true, finely grated lime zest and a teaspoon of vanilla paste will be tasty flavour additions. I’ve made meringues often; the Hungarian recipe I made, from Maida Heatter, was a little different to most recipes in that it called for cooking the egg whites with sugar over a water bath before baking, a la my beloved Swiss meringue buttercream. 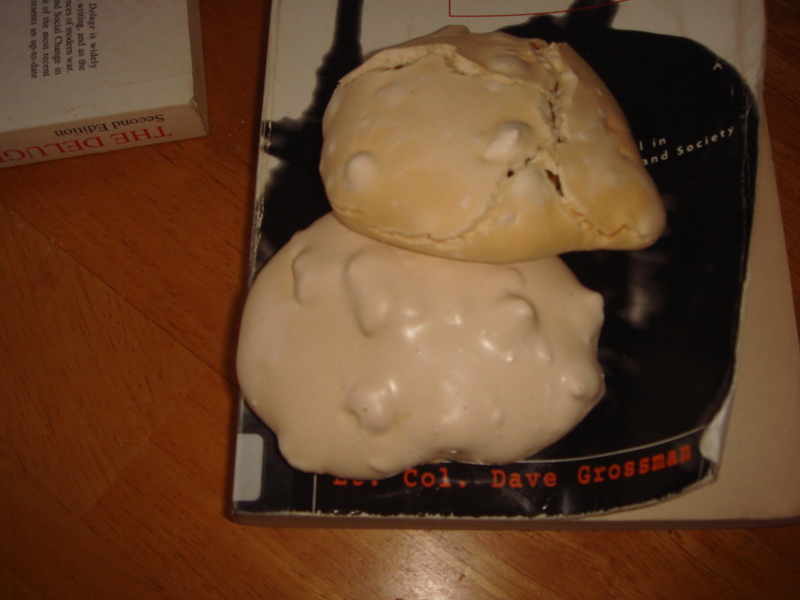 This made the outside of the meringues firmer and more shiny than most, and they were a little more robust and generally crisp throughout, although there was a hint of sticky gunge at their heart. Studded with walnuts, we nibbled them with fruit – they were particularly good with blueberries. I think Mary and Paul would consider them too big to be true petit fours, though – a fair point, so make little ones if you want truly petit fours. Finally, choux pastry. 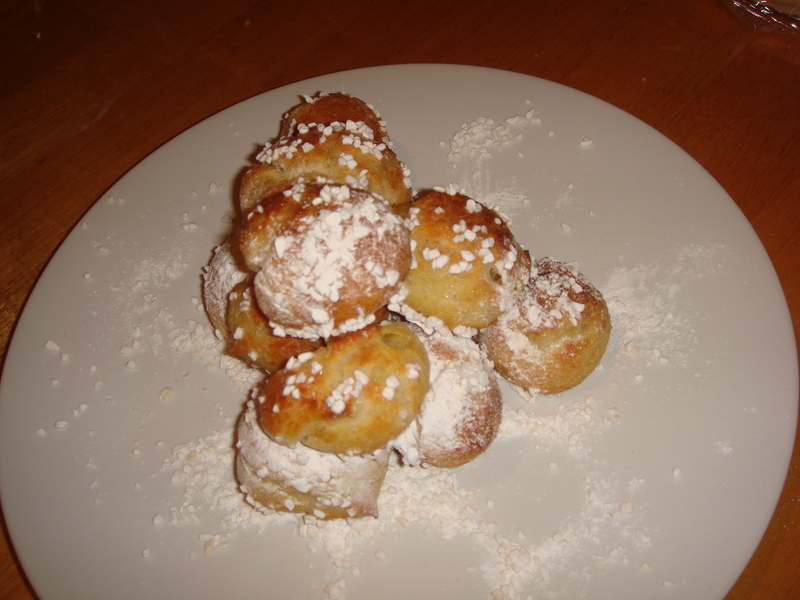 I didn’t make a pastry cream confection, but puffy, airy chouquettes. I couldn’t have been more delighted by Rachel Khoo’s recipe. The barely sweet, slightly salty choux was complemented by the sugar topping and dusting of icing sugar, and they were light, delicate and so addictive, with their puffed-out holow centre. Perfect for a teatime treat that won’t weigh you down. Incidentally, we had a bake sale recently at work (I didn’t participate) and a colleague made CHOUX PASTRY SWANS. God, they were so beautiful. I don’t know who made them but I was awed at their talent. My chouquettes were much more homely. Pour water and milk into a pan and add the butter, salt and sugar. Place the pan on a high heat to melt the butter. Turn the heat down to low and add all the flour. Beat hard with a wooden spoon – it’s hard work. At this point, the mixture will have the consistency of lumpy mashed potatoes – continue beating until its a smooth ball that pulls away from the sides of the pan without sticking. This didn’t take too long for me. Remove pan from the heat and continue to beat until the dough is cool enough to touch. You can speed this up by moving it to a bowl. Once the dough has cooled down, mix in the eggs, one at a time. The batter will get lumpy again once you add them but keep beating continuously and it will smoothen out. I used a wooden spoon only for this part. Once the eggs are incorporated and the mixture is smooth, scrape the dough into a piping bag fitted with a large plain nozzle (a tip I picked up from The Little Paris Kitchen was to stand the piping bag in a cocktail shaker to support it as you fill it). Line several baking trays with baking paper, dotting a little bit of the dough in each corner of the baking tray to hold the paper down. To pipe the chouquettes, hold the bag tightly, with the nozzle held at a 90 degree angle, about 5mm from the tray. Keep the nozzle upright and pipe a walnut-sized ball of dough onto the tray, then quickly flick the nozzle sideways to stop the dough trailing. If little bumps of dough remain on the dollops, wet your finger and pat them down gently. Repeat to make 20-30 chouquettes, leaving a 2cm gap between each one. Sift over a little icing sugar over the chouquettes, leave for a minute or so, then dust again. Sprinkle with the pearl sugar – I patted them into each chouquette very gently. Bake for 15-20 minutes until golden. Remove from the heat and beat, using an electric mixer or whisk, at high speed for 5-7 minutes, scraping the sides down frequently, until the mixture forms stuff peaks. It should be thick and shiny (if you can hold the bowl upside-down without the mixture spilling out, it’s ready!). Use a little of the meringue mixture to hold down the aluminium foil or baking paper. Fold the nuts into the meringue mixture. Measure out a heaping tablespoon of meringue mixture (bearing in mind my comment about them being large – adjust if necessary) per meringue, using one spoon for picking up and another for pushing off. Bake for an hour and a half (90 minutes), reversing the sheets halfways through to ensure even baking. After this time, switch the oven off but do not remove the meringues from the oven or open the oven door. The meringues should remain in the turned-off oven for up to an hour more. However, keep an eye on them; they should not colour more than a very pale gold. After they have reached this colour or when the hour is up, remove from the oven and remove carefully from the boil. Any cracking that occurs during baking is normal and to be expected! I suggest serving with berries, and maybe some cream. These keep and store well.